It’s been so long since the last time I reviewed pop art. I know that some people will call all pop art products as kitsch. However, its unsure for what kind of parameter an art can be listed as “inferior” or pop. Now, modern artists and philosophers find bunch of difficulties to define whether, for instance, pop art is kitsch or not. Over the debate, I’d like to recall one of many kind pop art products; a song. This song mustn’t be concluded as kitsch since it has the beauty and the complexity. This song has something that keeping me re-interpreting it. And, I am sure that those modern artists and philosophers will be on my side saying this song is definitely a fine art. Rembulan di malam hari The moon by night. lelaki diam seribu kata A man has no words; in silence. hatinya luka hatinya luka at his wounded heart. hatinya luka His heart is wounded. terbentur dinding hits the wall. angin sepoi-sepoi there is a slow wind. Let’s take a look at rembulan di malam hari, rembulan di wajahmu, and lelaki dan rembulan bersatu . Rembulan in rembulan di malam hari must be translated as the moon. 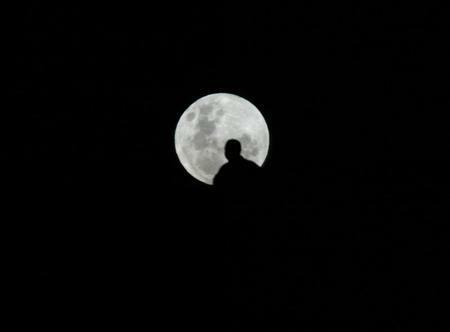 Rembulan in rembulan di wajahmu has two possible meanings. It is the moon, the literal meaning and happiness, the metaphoric meaning. …agar ku lihat lagi rembulan di wajahmu. Yes, it’s true that this is a sad song but it’s a good one. It deploys a unique way of confronting two possible interpretations of the moon. there is a slow wind. I always get mixed up whenever coming into this verse. Is it from the beginning the moon (happiness) and the sad man are portrayed in the first scene and the blow of the wind is just to close the curtain; like in a play on a stage? A man has no words; in silence. On Lelaki dan Rembulan by Dipa Nugraha is licensed under a Creative Commons Attribution-NonCommercial-NoDerivs 3.0 Unported License. This entry was posted in Essay and tagged Franky Sahilatua, Lelaki dan Rembulan. Bookmark the permalink.